The hunt is on for a $250,000 payroll robbery. 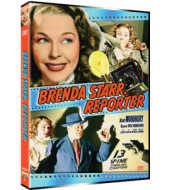 The police are looking for it, and—mostly just to be annoying—so is ace reporter Brenda Starr (Joan Woodbury) and sidekick relief photographer Chuck Allen (Syd Saylor). The main clue is a man named Joe Heller. As the serial begins, Heller is trapped in a burning building. Henchman Kruger guns him down and sticks Brenda in a closet so she'll burn. Lucky for her, her boyfriend Lt. Lawrence Farrell manages to rescue her. And we're off and running! Brenda has her usual knack for getting into tight situations –exploding mines, burning buildings, and the like. Chuck bounces between useless and useful, thereby making it hard to hate the character like so many other comic relief characters. Lt. Farrell constantly ends up berating Brenda and Chuck and their editor. NOTICE: This DVD was produced from the best existing materials however, this presentation is not up to our normal standard of quality. We have done our best to restore the film but unfortunately, most of the elements have suffered severe nitrate film deterioration, including the loss of sound and video in parts of chapters 3 and 4. We will continue to search the world-over for better film material, but for now, this is the best presentation of this classic serial that is available.